Netherlands champions VRA team. Maurits van Nierop was part of the National team selection until he died in a tragic accident in Cape Town in September 2008 at the age of 25. You are invited to witness this special match on Thursday 11 August 2011 starting at 3.30 pm. 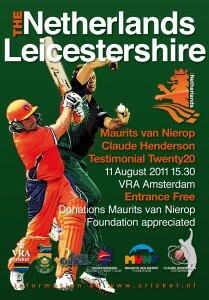 Entrance is free, but donations into the Maurits van Nierop Foundation are appreciated. The MVNF supports various sports and education projects for underpriviledged children in and around Cape Town. Leicestershire Claude Henderson, Matthew Hoggard, Paul Nixon, Jigar Naik, Nadeem Malik, Alex Wyatt, Nathan Buck, Josh Cobb, Matthew Boyce, Tom New, Greg Smith, Jacques Du Toit, Andrew McDonald, Wayne White. The Netherlands Peter Borren, Alexei Kervezee, Wesley Barresi, Eric Szwarczynski, Tom de Grooth, Mark Jonkman, Tim Gruijters, Mudassar Bukhari, Amil Prasad (overseas), Pieter Seelaar, Atse Buurman (wk), Bas Zuiderent.